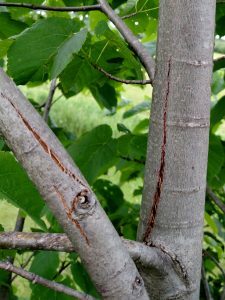 Young trees whipped by winds may have splitting bark on their branches or trunks. The trees will eventually grow over these, but first the wounds will dry out and open up a bit more. Storms, storms, and more storms! It seems like we’ve had a lot of storms that brought severe weather this year. Storm damage to oaks at this time of year creates the risk of oak wilt introduction in new areas as the beetles that can spread oak wilt are attracted to the fresh wounds from the storm damage. Pine that is damaged by the storm can be infested by bark beetles, or blue stain can enter the wood via hail wounds, or Diplodia can kill branches that were damaged by wind or hail. When blowdown or tornado damage occurs it presents some additional forest health concerns with staining and decay. We have some information available online regarding storm damage, which currently highlights the May 16 tornado but applies to all tornado/wind damage to your trees. Some of the storms during the past month are highlighted below. 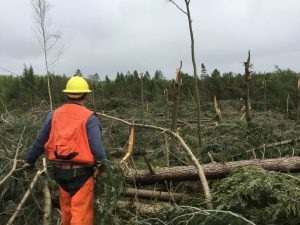 On May 16 blowdown occurred in Southern Oneida County, near the Oneida/Lincoln border, on county forest land. It was later confirmed as an EF-0 tornado. Storm damage occurred in several areas of the NHAL State Forest around Boulder Junction as well. This storm also produced a tornado that traveled through Polk, Barron, Rusk, and Price counties, which is detailed in a separate newsletter article. Blowdown on the Oneida County forest. Photo by Ricky Keller. 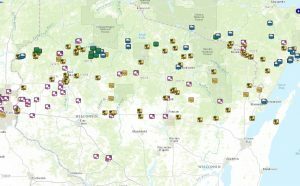 This National Weather Service map shows storm damage from May 16 & 17. Purplish squares are hail damage, yellow squares are wind damage, yellow squares with a tree are tree damage, orange is a funnel cloud, red is tornado. 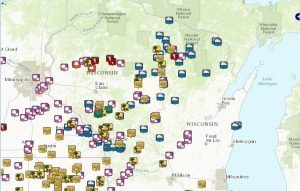 June 11 storms created damage across a wide swath of the northern half of Wisconsin. 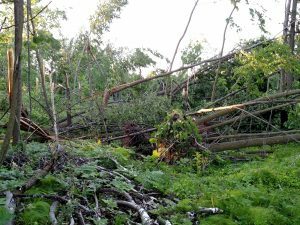 Strong, straight-line winds uprooted or broke trees in many areas including Vilas, Oneida, Lincoln, and Oconto counties. Paul Cigan reports damage in northwestern Wisconsin in the towns of Sand Lake (Sawyer Co.) and Stone Lake (Washburn Co.). Damage from these storms tended to be scattered throughout stands and generally there were no large areas of complete blowdown. Heavy rain and hail also caused issues in a number of areas. Scattered large trees were uprooted or broken off from the June 11 storm. This National Weather Service map shows the storm damage from June 11. Purplish squares are hail damage, yellow squares are wind damage, yellow squares with a tree are tree damage, green is flooding, and blue with a cloud is heavy rain. 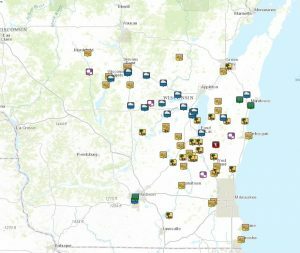 June 12 storms passed through east central and southeast Wisconsin with strong winds and hail. This National Weather Service map shows the storm damage from June 12. Purplish squares are hail damage, yellow squares are wind damage, yellow squares with a tree are tree damage, green is flooding, blue with a cloud is heavy rain, red is tornado. 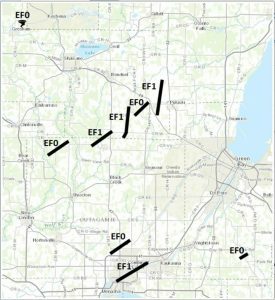 This National Weather Service map shows the tornado tracks in Brown, Outagamie, and Shawano counties, from the June 14 storms.